One of my very favorite parts of this crazy “career” of being a blogger is getting to play with new and fun craft materials! 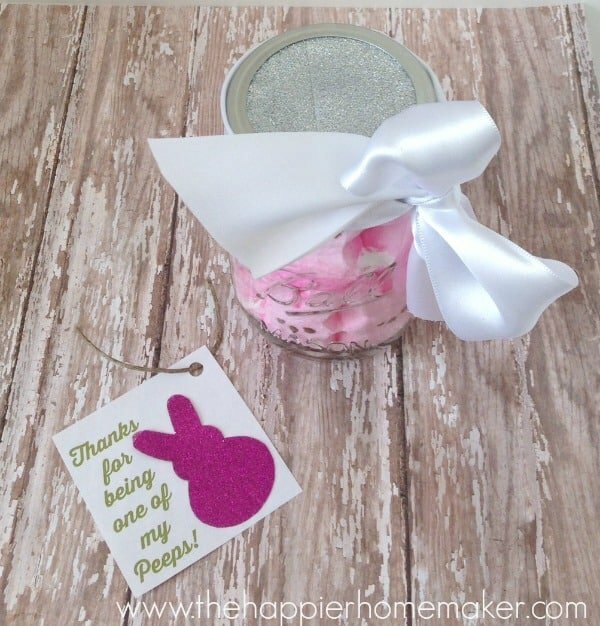 Recently I received a box of Duck® Tape goodies with the challenge to create an Easter themed project. I asked you all on Facebook what you would make once I received them and got some fun answers! 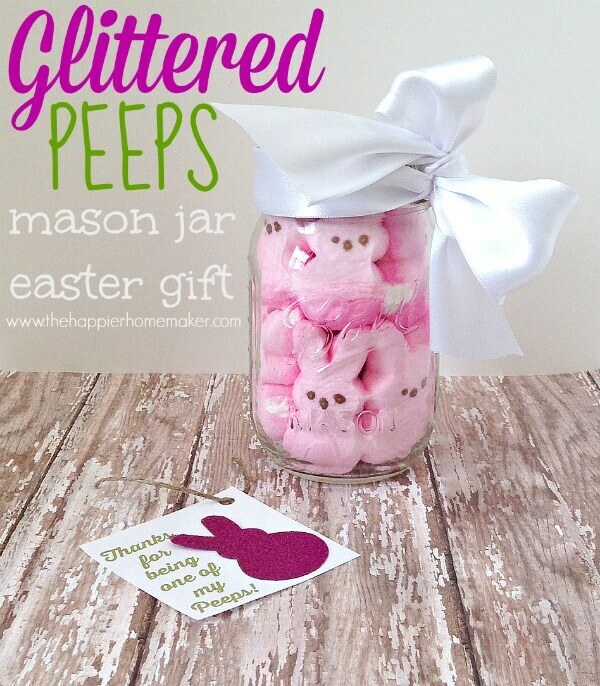 I decided to make a fun little Peeps mason jar gift and share it with you today. 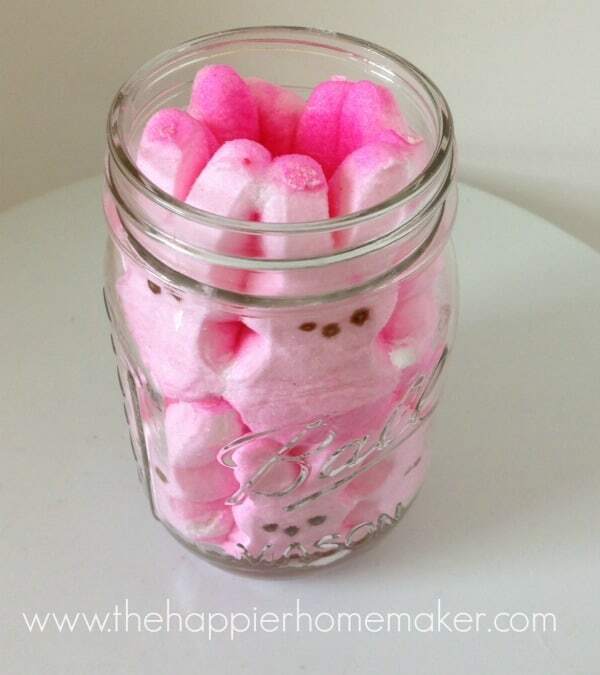 Start by lining your mason jar with Peeps. I found that 6 Peeps on the bottom row and 5 Peeps on the top row fit in my pint-sized mason jar perfectly. 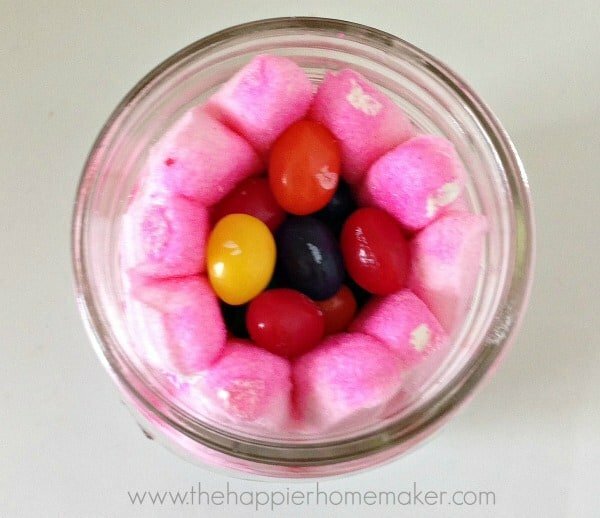 Fill the middle of the Peeps with jelly beans. 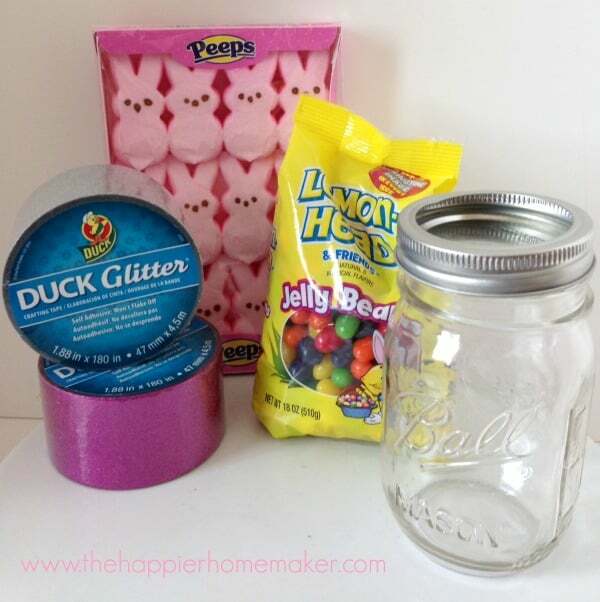 Cover your mason jar lid with glitter Duck® Tape and trim excess. 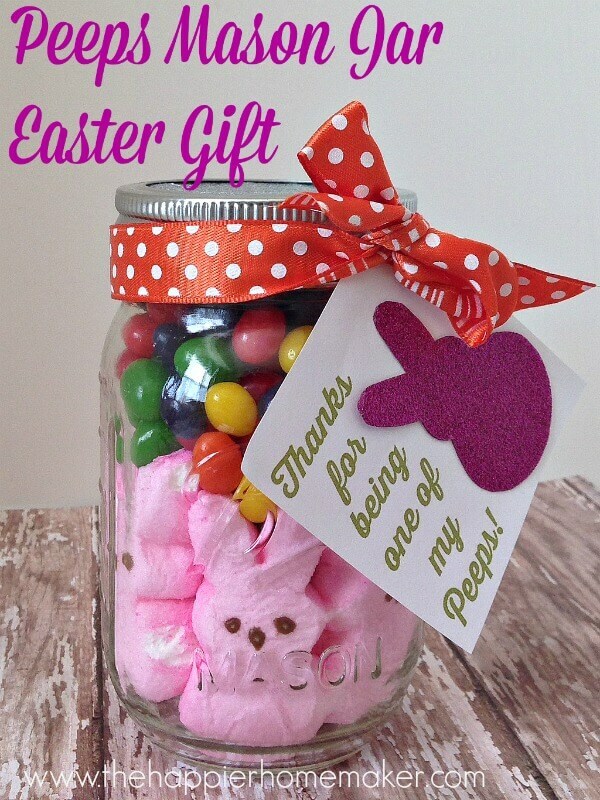 Put lid on the jar and tie with your choice of ribbon. To create your glitter peep silhouette take a 5″ piece of glitter Duck® Tape and fold in half so the sticky sides are together. 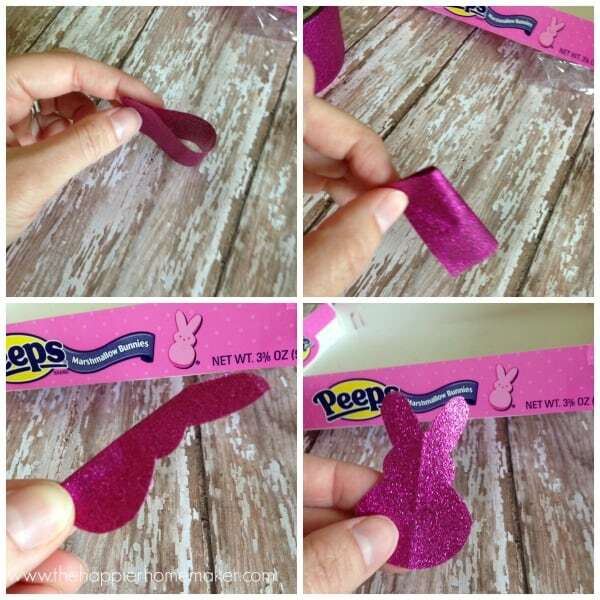 Gently fold in half again and cut out one half of your Peep silhouette (this makes sure the sides match!) Unfold and trim as needed. Print the free printable Gift Tags you can download here and cut out. 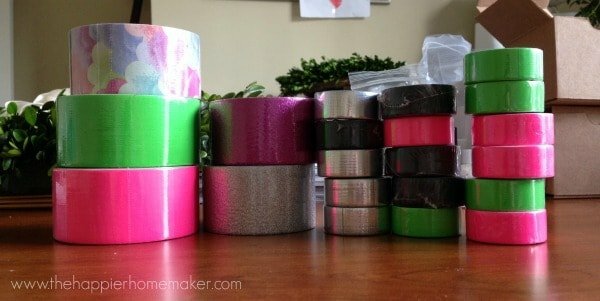 Use adhesive to attach your glittered tape. Hole punch and attach to ribbon with twine. I also made another version of this gift with only one row of Peeps and more jelly beans, I can’t decide which I like better! What do you think? Which version is your favorite?? I love this. Looking for peeps and jellybeans tomorrow! Plus the jars.